When it comes to transmitting video signal on considerable distances, it is immediately clear that default media (be it coax cable or twisted pair), is far not enough and distances can be as much as hundreds of meters, and that’s it. 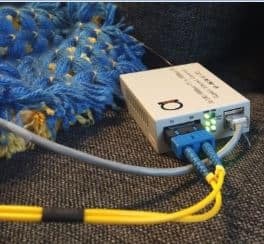 This is where fiber steps in and then you are armed with tools that can send your video signal not just tens – but more than a hundred kilometers away. Choosing fiber as a core for the video surveillance network, or for any other video sensitive material, is getting popular today. Not only fiber provides numerous benefits in a long term, it is able to exceed copper and coaxial means of data transmission. And here, you need to decide, what kind of video signal you want to send, since solutions in market are various, like HDMI, VGA, regular CCTV signal for cameras along with PTZ data control, SDI HD definition signals and more. Typically your scheme will look like this, like you have camera or cameras, video fiber transmitter and video fiber receiver, fiber in between and then DVR or monitors where you get picture from cameras. Pretty simple and this is really so – these video fiber converters are really plug-and-play! Considering design for the surveillance network, one must decide if the network will be combined with other networks in the infrastructure, or it will be completely independent network. Separate network would have isolated traffic which might be considered as additional security measure in some scenarios. Transmitting and receiving LEDs and lasers could not be affected in any way, if the cable has been damaged – which is good news if the one decided to use high quality transmission equipment. This includes short circuits and any environmental way of affecting the cable. Fiber has much greater bandwidth than any other means of data transmission, which is why it is perfect for sending high quality uncompressed video. Bigger bandwidth means bigger chunks of data can be passed. It is possible to use HD cameras for real time surveillance. In order to minimize the cost of installation and maintenance of fiber optic based network, it is recommended to train staff on professional level to work with fibers. Proper testing during installation and network monitoring/maintenance will highly reduce cost and increase the speed of troubleshooting and new network deployment. While considering the budget it is important to remember the initial goal of the network. Since market provides numerous solutions, it is important to know what level of quality, distances, and bandwidth is required. Choosing fiber mode (single mode/multimode) is affecting the signal strength and the distance it can travel without degradation. Different fibers lead to different types of LEDs and lasers, which can result in different project costs.